With the U.S. Bureau of Labor Statistics predicting 1.4 million new jobs by 2020, computer science will continue to be a promising field. An online PhD in computer science can open the door to the best of those jobs, including teaching and research positions in academia, government and industry. Before pursuing a PhD, it’s important to explore different programs to determine what each school has to offer and what is required for admission. Find PhD programs and options below, and see where they can lead. 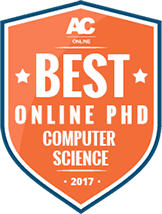 Online computer science PhD programs offer students the opportunity to earn an advanced degree in a flexible environment, as well as the potential to earn high salaries after graduation. In fact, the 2015 State of College Hiring report listed computer science majors as the highest paid graduates in the country. It’s no surprise students are seeking these advanced degree programs, especially ones that allow for specialization in a particular area of interest. Most online PhD in computer science programs require applicants to take the Graduate Record Examination, so it’s important to find out the minimum accepted score ahead of time. Purchasing a test preparation booklet or taking a GRE preparatory course can help boost scores. Transcripts document that applicants have obtained a bachelor’s or master’s degree in computer science, or equivalent preparation in computational science subjects. Applicants typically have at least a few years’ experience in the field and should demonstrate practical work on a resume. They should also include a list of research publications that show their work if possible. Applicants should use this to express their interests and plans in computer science in a concise and clear manner, including the principal reasons why the student would make a strong applicant. These letters should come from people closely acquainted with the applicant and explain the student’s academic competence. Generally, more weight is placed on letters from the academic community, especially professors who can testify to the applicant’s potential as a researcher in the field of computer science. Students begin the doctorate program by taking required core and research courses that cover the central doctrines of computer science. In addition, research courses will introduce students to effective research methods, as well as various ways to analyze information, such as statistics and qualitative reasoning. Throughout the first and second year, coursework becomes more advanced, building upon the foundation already set. During this time, students meet with their faculty advisers at least once a semester to assess the progress they’ve made in their coursework, lab rotations, thesis committee meetings, and other responsibilities. Planning for the Doctoral Board Oral (DBO) examination also begins during the second year. If students haven’t yet completed their final comprehensive examinations, they will do so during the third year. However, the main focus of the third and subsequent years is researching and writing the dissertation and providing regular updates to their advisers. Upon completion, the dissertation must be presented to a panel. The student is responsible for explaining the research, methodologies, and conclusion, and defending the dissertation to the panel. Most schools require students to finish their dissertations by the end of the fifth year. The process starts with a proposal that is given to the advisory committee. Each year, the student participates in a formal meeting with a research mentor to discuss the status of the project, the organization of the lab environment, and long-term career goals. Finally, the dissertation must be successfully defended and deemed worthy of publication. Preliminary or Final Oral Examination. This examination assesses proficiency and provides an opportunity for critical examination of the student’s work by scholars outside the program. Preliminary examinations typically occur at the end of the second year. If there is a final exam, it concentrates on the student’s doctoral dissertation and its implications. Depending on the institution, students may apply for a leave of absence to complete a full-time internship outside the academic research environment, such as at a biotech company. Students may also have the option to use the intern experience for academic credit. While the PhD is a terminal degree, there are many routes to get there. Depending on students’ career paths, they may choose degrees that train them in areas such algorithms, combinatorics and optimization; or computational science and engineering. The degree may also take them from the computer lab to the biology lab with training in bioengineering or bioinformatics. Degrees are often tailored to a student’s specific interests, and may lead to careers in areas as diverse as artificial intelligence and machine learning, big data management, information security, software engineering, genetics, and robotics. While some degrees are offered only through a school of computer science, others may be collaborative, involving other departments such as math or business. Each degree has its own set of requirements, but most entail the completion of core courses, research rotations, and a dissertation. The focus of the ACO degree is the study of discrete structures and algorithmic issues arising in computer science and operations research. As a multidisciplinary program that is typically jointly administered by the schools of computer science, mathematics, and business, students can take advantage of the collaborative nature to enter through any of the three schools. Bioengineering is an interdisciplinary field that combines approaches from the experimental life sciences in conjunction with theoretical and computational methods from engineering, mathematics and computer science. With an ultimate goal of finding solutions to biomedical problems, this research-oriented degree program emphasizes advanced bioengineering, with concentrations in areas like neuroscience, genetics and systems biology. Electives include quantitative biology, applied mathematics, and engineering theory. It takes approximately four to six years to complete the online computer science PhD in bioengineering. Increasing amounts of data have made analysis an important focus in the field of biology. Bioinformatics involves the development and use of computational tools for gene sequencing, genotyping, and mass spectrometry.Coursework focuses on statistics, life sciences, molecular biology, genetics and other disciplines that influence bioinformatics in fundamental and systems biology. Real-world applications include disease diagnosis, classification, prognosis, and treatment, as well as drug development and genetic profiling. This interdisciplinary degree program prepares scientists, mathematicians and engineers to use the modern tools of computational science. Students learn to integrate math, science and engineering to prepare for research and development in many settings, such as engineering software systems, web technologies, and software for consumer products. Graduates may also work on systems integration, data mining, or computational modeling. This concentration examines the theories and applications of artificial intelligence, covering concepts such as neural networks, machine learning, cognitive modeling, and logic programming and reasoning. Students explore the current state of artificial intelligence and learn about future uses in military, government and industry settings. Designs, develops and manages code for computer software. Using the design parameters and objectives of a given software product, programmers write computer instructions that direct the hardware to run in the intended manner. Converts the tasks desired of a computer hardware system into software designs that can accomplish those tasks. These specialists are experts at translating the principles of computer science into real-world solutions. The explosive growth of the Internet, paired with the increased ease of gathering and storing information, has resulted in immense volumes of data. This specialization focuses on the methods, tools, techniques, and theories used in managing, processing and analyzing large data sets, in order to provide insights and conclusions for marketing and other purposes. Researches and studies complex computational problems. Investigates computer technology in order to promote software and hardware development, resulting in both brand-new technologies and new uses for existing technologies. Analyzes the computer infrastructure and systems of various organizations in order to help them become more efficient and effective. An analyst must balance the organization’s needs with the capabilities—and constraints—of a given computer system. Database design, development, management and application are the major focuses of this concentration. Students are expected to obtain a high level of familiarity with various information systems and be able to effectively explain them to colleagues who do not have technical backgrounds. Manages database systems for an organization. In addition to ensuring accessibility and efficient operation, these administrators are responsible for safeguarding the information in the databases. Designs and creates computer networks that range in size and complexity from a small home or office network to a wide area network that covers the entire globe. Architects evaluate a client’s needs and then provide suitable networks to meet those needs, taking into account technological and economic limitations. With data security a paramount concern of both businesses and consumers, information assurance is a major area of need in most organizations. This specialization focuses on the protection of data, as well as the systems that process, store and gather data. In addition, students learn how to assess and manage risks for software and hardware. Protects an organization’s information systems through the development, implementation and management of security measures. Responsibilities may range from creating an effective security system based on the client’s specifications to implementing real-time cyberattack security measures. This computer science specialization covers advanced concepts as they relate to the design, development and management of software, as well as the application of software to specific needs. Students are trained in software development life cycles, the engineering process, and project management, so they can effectively examine advanced software design concepts and anticipate future software needs. Students learn about the theories and engineering concepts related to securing networks and their associated data. Some of the areas covered include network protocols, data access techniques, and network intrusion detection. Whether currently enrolled in an online computer science PhD program or already working in the field, those with an interest in computer science can benefit from the following resources. Includes information on current news and events in the industry. Association for Women in Computing. Provides professional networking opportunities, mentoring, continuing education and other resources for women in the field of computer science. Features information about available grants, networking opportunities, and outreach experiences. With sections for researchers and students, this site offers information about government affairs, upcoming industry events, and computer science jobs. This site provides certification requirements and examination details for ethical hackers. The society provides national conference information, scholarly articles, educational opportunities, job leads and more on this site. International Association of Computer Science and Information Technology. Opportunities for further education as well as conferences are available on this association website. International Society of Forensic Computer Examiners. Provides resources for certification, training, and proficiency testing. As the international honor society for computer and information disciplines, Upsilon Pi Epsilon recognizes academic excellence at both the undergraduate and graduate levels. Students can find membership information and chapter news at this site. Featuring articles about all aspects of AI, this twice-yearly journal includes works by award-winning professionals in the AI community. This international journal is dedicated to advanced programming theory and mathematical proofs. An annual journal that publishes articles about practical and theoretical projects that involve logical methods. Features essays and articles about the field of theoretical computing. Find Online Computer Science PhD Programs with the accreditation and affordability you need with our complete database of schools.